Telkom Prepaid LTE / LTE advance SIM card and data for 30 days . All you need is a dongle/pocket router to connect to the Internet . 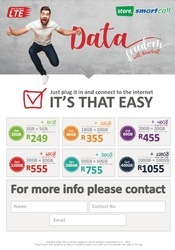 Please support a great saving business it's good Telkom prepaid data deal with can be recharged every after 30 days no contract and no other networks offers the same. Please read all attached deals and contact me once you satisfied and want to sign/register for this prepaid deal. Prepaid deal without the dongle. Contact me: Thabiso Matsieng , 0603462191/whatsapp. Email: thabiso_g24@yahoo.com to check if there is coverage in your area, then we get you connected with the best Telkom prepaid service.